Helen Virginia Waters Dukes, 87, returned to her heavenly home on January 29, 2019. Her strong will to live, unwavering faith in God, and the love and prayers of family and friends carried her through her last days. She was born on January 2, 1932 in Lake Butler, FL where she remained a lifelong resident. Helen was the beloved wife of the late Peter Mann Dukes. She is the daughter of the late William Olvid and Florence Waters. Helen had many accomplishments during her lifetime, with her proudest being her cherished daughter Mary. She was a devoted mother and loving wife. She was very proud of her 6 great-grandchildren and loved spending time with them. Helen was elected the first female Tax Collector in Union County in 1965 and proceeded to work as a secretary for many years after. 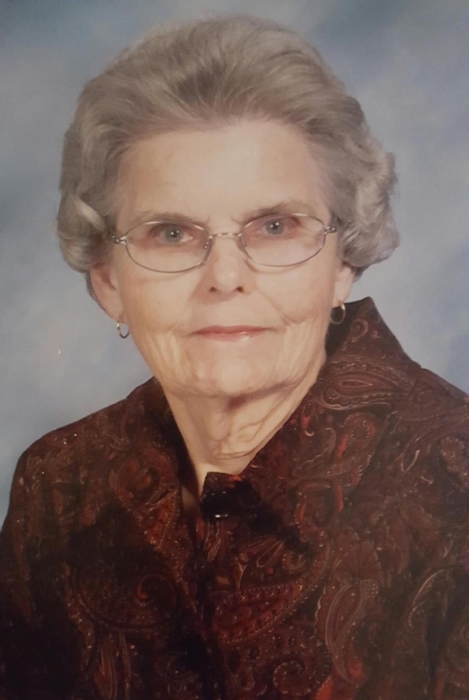 She was an active member of the Lake Butler Church of Christ and loved her church family. She was a part of the TOPS Club where she enjoyed the time she spent with the members. She loved reading her bible and doing crossword puzzles. She always enjoyed cooking and serving others. Helen is survived by her loving daughter, Mary Parsons (Steve); her grandchildren, Kevin Parsons (Melissa) and Amy Bedenbaugh (Kevin); her great-grandchildren, Brendon, Kailey, Ethan, Chase, Mason and Kloey; and her sister Wanda Wall (John). Helen is preceded in death by her parents, husband, and brothers Herbert Waters, Herman Waters, and Harold Waters. She leaves many other friends and family that will miss her dearly. Services for Helen will be held at the Lake Butler Church of Christ on Friday, February 1st. The family will receive visitors at 1:00 pm with the funeral service to follow at 2:00 pm. Buriel will follow at Elzey Chapel Cemetery, Worthington Springs, FL. Helen has requested that donations be made to the Lake Butler Church of Christ in lieu of flowers. A special thank you to all of the nurses and staff at Haven Hospice of Lake City for helping take such loving care of Helen in her last days and also to Archer Funeral Home for taking care of her final arrangements.